Developer: Nintendo EAD Group No. 4. Hot on the heels of the famed DS bestseller Brain Training: How Old is Your Brain?, a more basic, light-hearted offering to the casual/educational puzzler genus made its début. 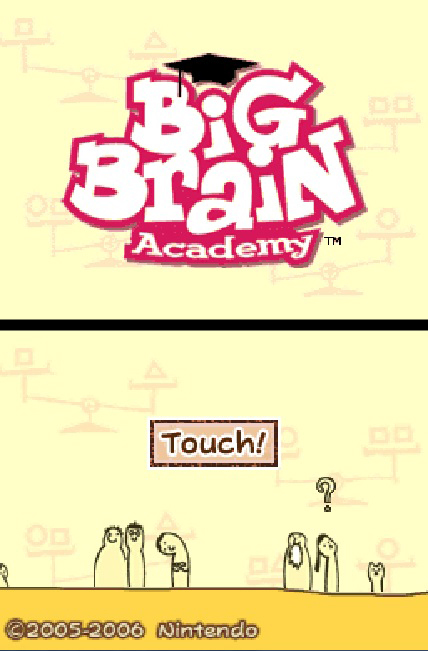 Based on the more colourful and amicable social media-based quizzes; the bright, cartoonish facia of Big Brain Academy certainly feels easier to get along with on first impressions. However, this more affable and simpler approach filters through the selection of puzzles and tests, reducing any long term benefits to a brief skip over the screens, be it educational or entertaining. Some morsels of solid-thinking enjoyment can be eked out of this in spates, but once they are chewed up, your brain will be searching for a more extended and grown up challenge. On the outset, it all looks rosy for Big Brian Academy. It certainly has an approachable list of qualities, differing it from similar titles. 15 tasks separated into 5 categories of the thought process, a grading test feature and versus play without the aid of multiple game packs. 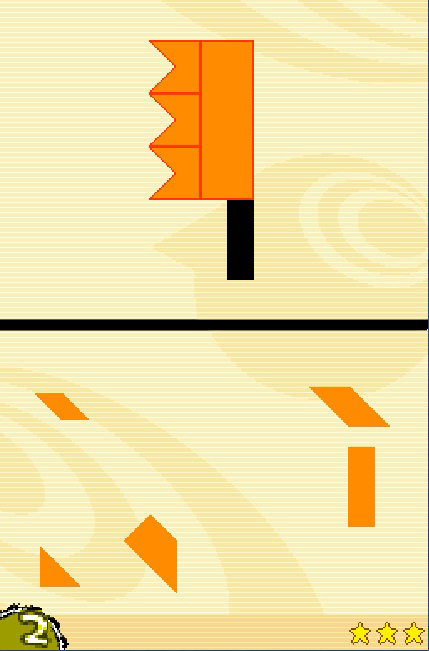 It also doesn't require daily play to keep your progress up to date, giving it the inkling of a durable informal title. Unfortunately the worth of each game within varies; there doesn't appear to be a good balance of difficulty, the summarising is tough to ascertain and the visuals are entirely uninteresting. That’s not to say it’s a bad looking game, it’s just way too basic and juvenile. 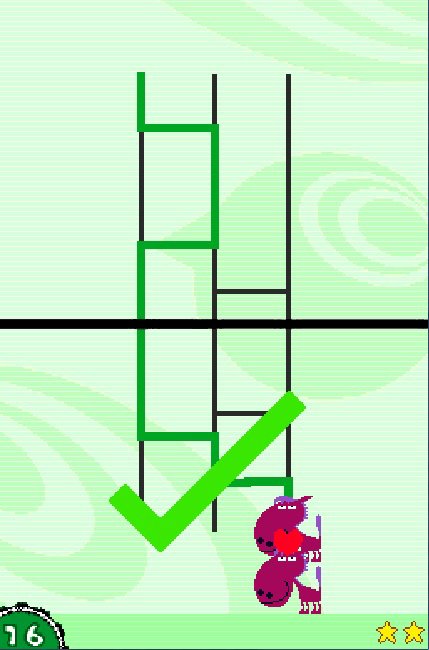 The top screen never alters outside of the puzzles, with the awfully designed, wobbly character of Dr Lobe giving you your help and grades. He has good advice at times, but never seems to urge you on since any constructive or negative criticism is absent or incredulous, even if you barely try. Menial phrases and the usual “That’s not bad” gumph is the order of the day, and this reeks of a game aimed at pre-teens. Ladders of Destiny. Every brain game has 'em! If this was the intended target audience with the theme carried through to the puzzles themselves, it would stack up and be a nice educational tool for young people. But this is not the case. Whilst some of the picture matching and memory games are low-key, others are incomprehensibly tricky. Achieving a platinum level on such puzzles is far too taxing for a young mind, nay, sometimes even too much for an experienced brainiac. Once you’re near your peak, you just don’t have the impulsion to get any better. This I ascribe partly to the minimal presentation and lack of motivation included. Brain Training had this ability, to encourage you further even if you felt you couldn’t improve; this doesn’t have the same effect. The difficulty imbalance and childlike depiction of the games is off-putting in the long run, so once you have played them, any draw to return to them is nominal. However, there are some aspects that make BBA playable at least for a short while. A few of the more original, well-judged games can be good fun. The shape completion, coin addition and sequence matching tasks are entertaining and fairly challenging, and the primary aim of rising your ‘brain weight’ and grade does keep you trying hard in the very beginning, that is until a game like the bone search or basic maths quiz demand too much. Also, the wireless multi-player game can be really good, and great in a family group. The fact that only one cartridge is needed for this is a real bonus. ...And locate the laser trip wire. High octane! As a rival to Dr Kawashima, Dr Lobe is very lame and a dimwit in comparison, missing any kind of charisma or personality that is required in games of this ilk. His blob-shaped demeanour is laughable, but I suppose this matches up to the rest of the visuals. With no enjoyable transitions, comedy asides or variance of subject matter and tools, it’s all a bland orange and beige cartoon waiting room of mediocrity. Okay, the background colours do change sometimes and it’s all neatly presented enough; bold, clear pictures and symbols is of course essential, but it has no soul or uniqueness. Things fair only a little better on the audio. The single, chintzy main theme is passable enough, as is the sultry backing lift-music, but all the effects are terribly humdrum and bog standard, save for some nice sampled speech and animal sounds now and then. Nothing original or massively distinctive. At least there’s no problem with game interaction; with accurate, quick wand detection and forgiving drawing actions it’s very easy to pick up and get going. And thankfully, no voice recognition or spoken word problems like the aforementioned Brain Training. None of the puzzles use this and thank the heavens for that. 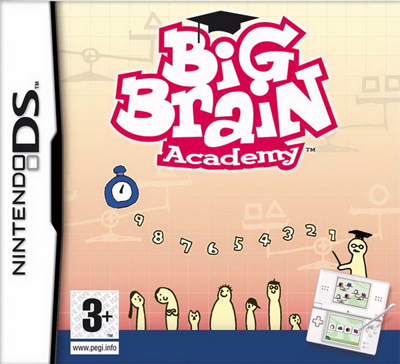 Big Brain Academy disappoints me. I can be quite fond of these relaxed IQ challenging titles, and was hoping for a lot more from this. It’s cute, welcoming outward appearance gives this impression of something more entertaining than a straightforward electronic quiz book, but alas the slapdash mixture of puzzles, sparsely changing and lacklustre graphics and limited play back virtues ruins what could have been a neat little lifestyler. It just doesn’t know what it’s supposed to be; an adult mind-melter or a children’s schoolbook. Maybe it just about gets into the family level of casual gaming, and can provide a tiny spark of delight, but I can guarantee some of your kith and kin will get upset about it. Try the board game instead.